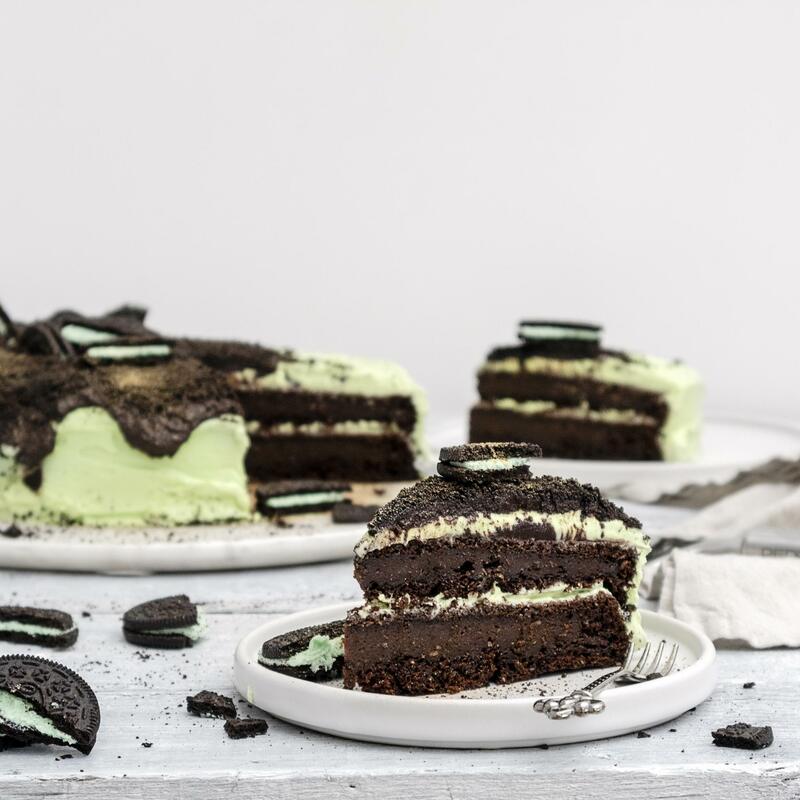 I first created this recipe right before Halloween and doesn’t “Vegan Chocolate Mint Oreo Cake” say it already? This cake might look super spooky with it’s green and minty colour – but it’s honestly perfect any time of the year! 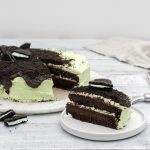 I personally have always loved mint chocolate, so I was way overdue with creating my own chocolate & mint cake recipe – but here we (finally!) are! 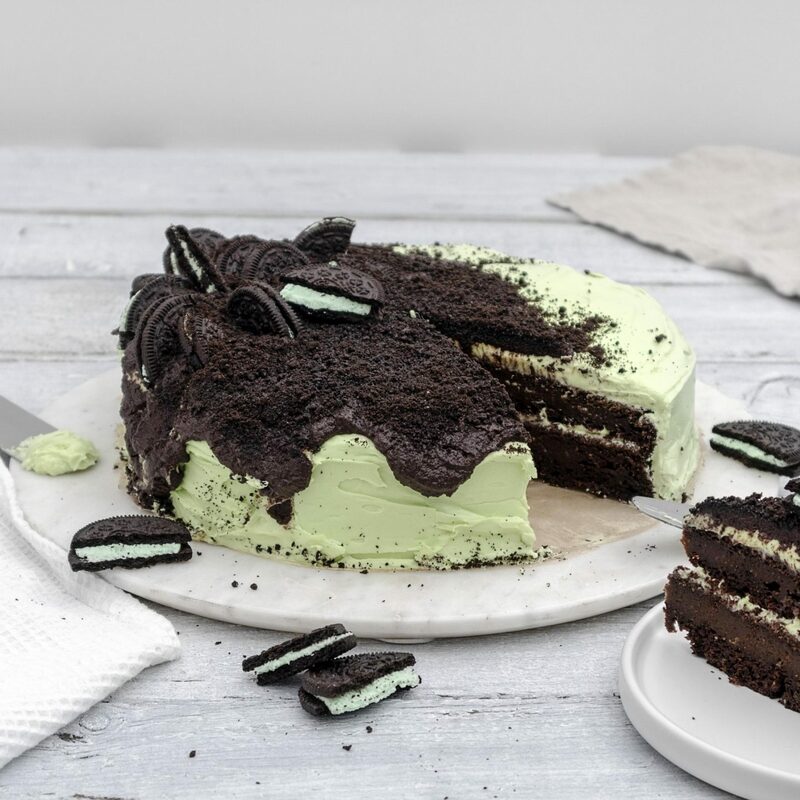 I created this cake with Mint Oreos, which are accidentally vegan and therefore the perfect inspiration for this recipe (my favourite flavour besides the green tea flavour, which is sadly not sold in the UK). 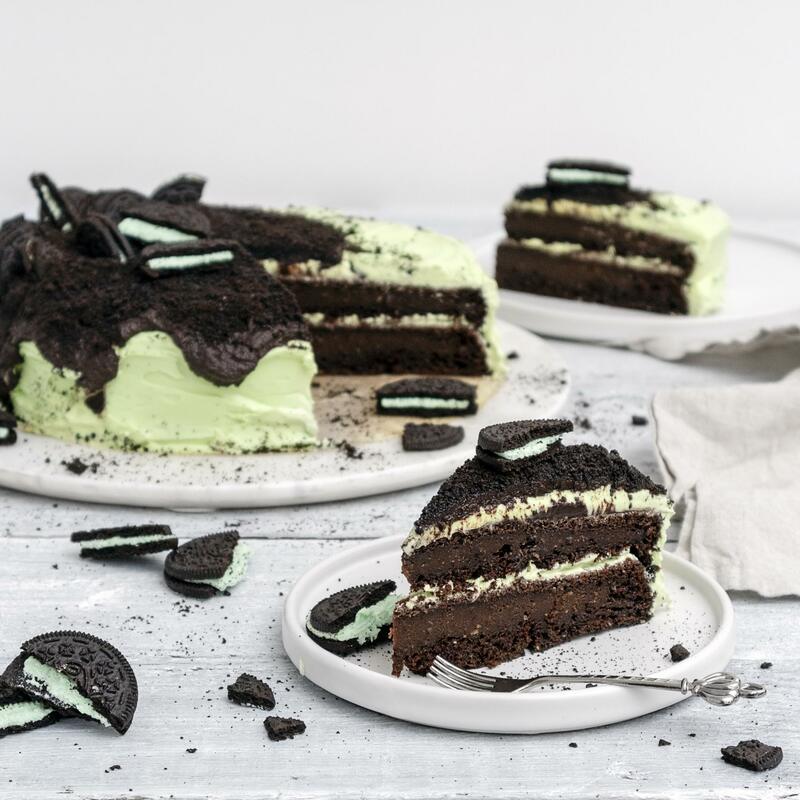 Using the crumbled biscuit on the chocolate ganache on the cake makes the cake topping look like a layer of gravel & soil – and with the broken Oreo halves on the top, you could say it’s an Oreo graveyard, right? Whether you’re having this cake for Halloween or not – I hope you’ll enjoy it just as much as I did! 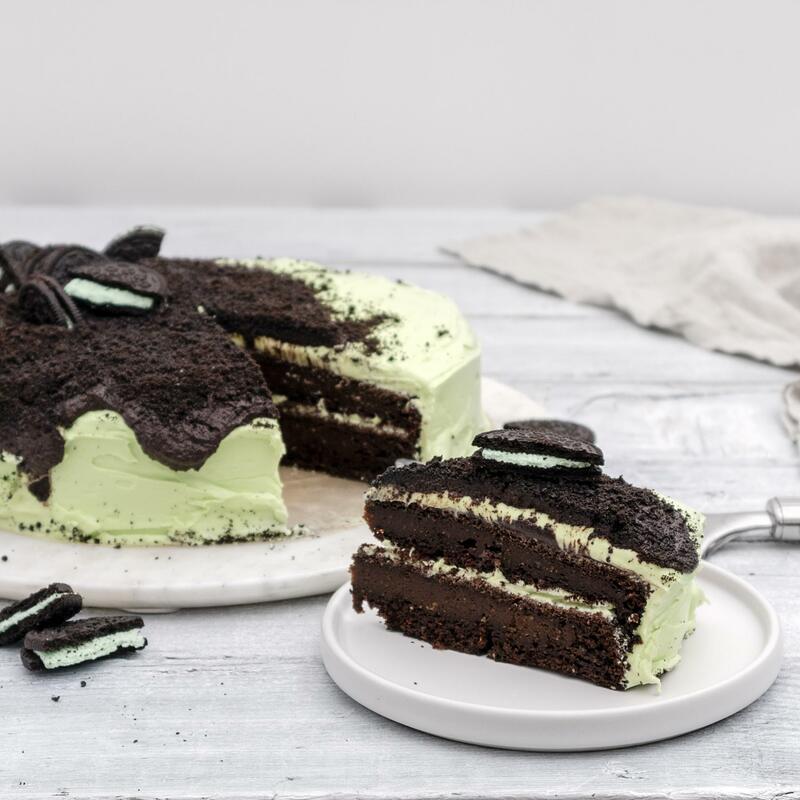 This delicious Vegan Chocolate Mint Oreo cake consists of 2 delicious layers of dark vegan chocolate with a delicious vegan mint buttercream in between and topped with crumbled Mint Oreos. Preheat your oven to 180C fan/160C gas and start by preparing the chocolate cake: Sieve and combine the flour, cocoa powder, baking powder and baking soda. In a large jug combing the plant-based milk with the Apple Cider Vinegar and juice of 1/2 lemon. Briefly stir and set aside for about 15 minutes to curdle – best place the jug into the fridge during this time. In the meantime mix the flaxseeds with about 5 Tbsp of water and and also set aside to soak for 10 minutes. Once the curdling time for the milk has elapsed add the sugar (or sugar replacement if using), maple syrup, melted chocolate spread, vegetable oil and vanilla extract and stir well until the sugar dissolves. Add the flax ‘egg’. Make a well in-midst the dry ingredients and slowly pour in the mixture from the jug. Use a spatula to combine, then slowly pour in the hot water until your batter is thick but mixable with a spoon and all ingredients well combined. Grease two cake tins of equal size (I like to use coconut oil for this) and pour the batter equally into both of them. Bake in the middle section of your oven for about 35-40 minutes, or until a toothpick comes out clean. Once done, set the cakes aside on a cooling rack to cool down completely. It’s best to remove the cakes from the tins once they have cooled down for at least 20 minutes. Prepare your frosting: Add the butter to a medium size mixing bowl and blend with a electrical hand mixer until smooth. Pour in the vanilla extract, peppermint essence and food colouring. Carefully add the icing sugar in batches until the frosting is thick but spreadable. In the meantime start melting the chocolate bar over a double boiler on medium-low heat. Start assembling your cake my placing the first sponge cake onto a cake decoration stand. Spread the frosting on top to about half of an inch thickness, then place the second sponge on top. Cover the entire cake in the frosting, then set the cake aside into the fridge for the frosting to set. Whilst the cake is in the fridge, prepare the ganache. Gently melt the chocolate bar over a double boiler. In the meantime prepare your Oreo decoration: take about 10 Oreo cookies and remove the cream from them. Place the cookies into a freezer bag and use a rolling pin to crumble up the cookies in the bag. Sprinkle the Oreo crumbles on top of the ganache, then cut a bunch of Oreo cookies in half and place them onto the genache to decorate. Finish the cake decoration with some optional edible glitter (I used gold!) and place the cake in the fridge for at least 1 hour for the genache to set. Serve with whipped coconut cream and enjoy! Looking for more vegan cake recipes? Check out my Cakes & Bakes Section! Previous Post Is your electricity vegan? Next Post Cityspice London – The Best Curry in Town!